Ornithogalum bulbs are spring flowering and are planted in late summer to autumn. They are available in a number or varieties with different flowers and growth habits. As these are spring flowering bulbs they can be planted in the garden border, or in containers. They also grow well beneath deciduous trees near the drip line. You can also grow them in a cutting garden as they do make very good cut flowers. Ornithogalum are a handy plant, with taller varieties such as Ornithogalum saundersiae or the giant Chincherinchee are great for for the back of the border. With tall flower spikes of black spotted cream to white flowers. A well mulched soil with lots of humus and a sunny position. Planting depth – Plant at around 8 cm deep, pony end of bulb up. Planting distance – Space bulbs at around 15 cm apart in the garden. Closer in containers if you intend to repot every second year. Lifting and overwintering – These are a bulb that can be left in the ground for 5 – 6 years before they need lifting and dividing. In containers replant every 2 years. Water Requirements – Only water when the ground drys, normal rainfall is usually adequate. In very dry winter or spring periods water will be needed. Fertiliser – Feed by top dressing with aged compost and cow manure in winter. In containers use as slow release bulb fertiliser. 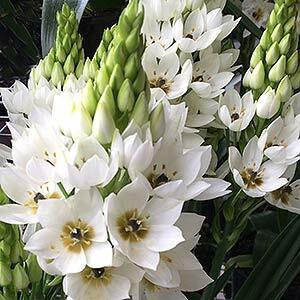 A genus that presents us with variety, Ornithogalum are a group of perennial bulbs, come with very attractive flowers, and some with common names that are more easily recognised. Grown in the garden border, and also grown for cut flowers each species has its own attraction. Popular species include Ornithogalum dubium and Ornithogalum arabicum. These are two of this this group of bulbs that are fairly easy to grow. Ornithogalum saundersiae which is commonly known as the Giant Chincherinchee. Ornithogalum thyrsoides is another popular species. Best known for the cultivars such as ‘Chesapeke Snowflake’ and ‘Chesapeke Starlight’ being very popular. Most species will self seed and should be planted away from forested areas. One solution to self seeding is to deadhead the plants after flower to prevent seeding. These bulbs will grow equally as well in containers and pots as in the garden border.